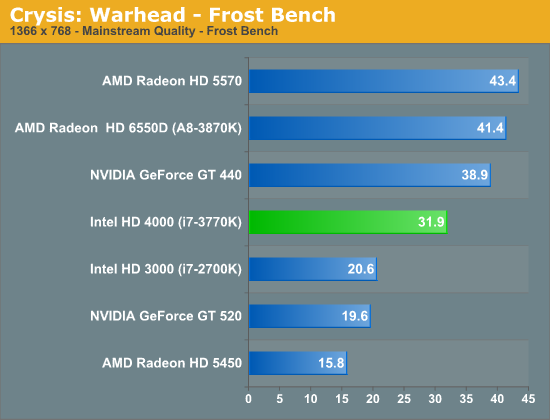 Our first graphics test is Crysis: Warhead, which in spite of its relatively high system requirements is the oldest game in our test suite. Crysis was the first game to really make use of DX10, and set a very high bar for modern games that still hasn't been completely cleared. And while its age means it's not heavily played these days, it's a great reference for how far GPU performance has come since 2008. 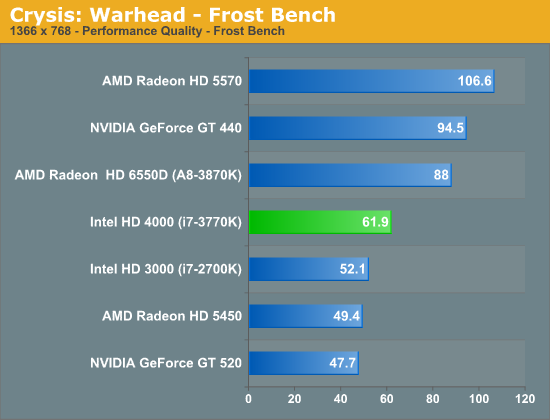 For an iGPU to even run Crysis at a playable framerate is a significant accomplishment, and even more so if it can do so at better than performance (low) quality settings. Over 50 fps at 1680 x 1050 from Intel integrated graphics is pretty impressive. Here we're showing a 41% increase in performance compared to Sandy Bridge, with Llano maintaining a 33% advantage over Ivy. 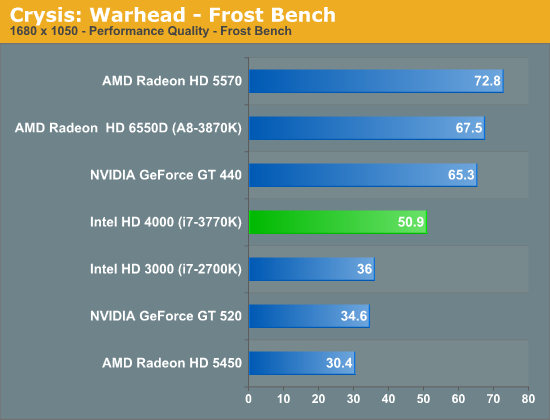 I would've liked to have seen an outright doubling of performance, but this is a big enough step forward to be noticeable on systems with no discrete GPU. I hope you give AMD even more praise when Trinity is released Anand. IMO you way overblew how great Intels igp stuff. Its their 4th gen that can't even beat AMDs first gen.
OpenCV is Open Computer Vision and runs either way. I think you're talking about OpenCL (Open Compute Language). and even that runs fine without a GPU. OpenCL can use all cores CPU + GPU and does not require separate code bases. Maybe we could actually see some hard numbers before heaping so much praise on Trinity? ?